Investors in exchange-traded funds backed by gold are looking beyond this week’s U.K. referendum on European Union membership and the declines in bullion prices it has spawned. Holdings in gold ETFs climbed for a 16th straight session on Tuesday to the highest since 2013. Investors poured $10.7 billion this year into SPDR Gold Shares, the most among more than 6,000 ETFs tracked by Bloomberg. Inflows into SPDR have already surpassed annual totals for every year since 2009. On Tuesday, Federal Reserve Chair Janet Yellen pushed the prospect of additional interest-rate increases further into the future. 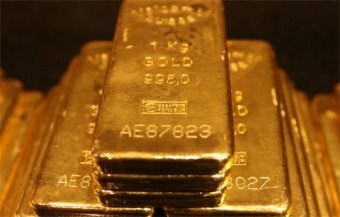 After reaching an almost two-year high last week, gold prices have posted four straight declines on bets that a vote by Britons Thursday to stay in the EU will undercut demand for the metal as a haven. Even so, risks to the global economy are helping gold ETFs. In her testimony Tuesday, Yellen signaled that her optimism in the U.S. economy had softened, and flagged potential threats including uncertainty over China’s expansion. The market’s attention will refocus on U.S. monetary policy should Britain vote to stay in the EU, Mark Keenan, head of commodities research for Asia at Societe Generale SA, told Bloomberg Television on Wednesday. Money managers boosted their net-long positions in gold futures and options by 29% to 240,862 contracts in the week ended June 14, according to U.S. Commodity Futures Trading Commission data released three days later. The all-time high was 253,653 reached in August 2011 - just a month before gold futures reached a record high. Yellen told the Senate banking committee that the Fed is on watch for whether, rather than when, the U.S. economy would show clear signs of improvement, acknowledging the possibility that growth would be slow to pick up. The prospect of rates staying lower for longer to help shore up economic growth is a boon for gold, which doesn’t pay interest. “Even rates expectations are taking a back-seat to what is happening in the U.K.” Thorsten Proettel, a commodity analyst at Landesbank Baden-Wuerttemberg in Stuttgart, said by telephone. Gold futures for August delivery slipped 0.2% to settle at $1,270 an ounce at 1:48 p.m. on the Comex in New York.